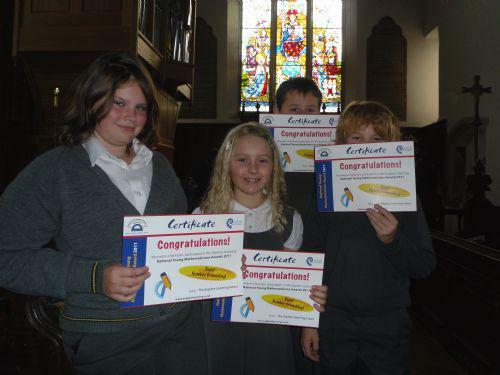 On Wednesday 2nd November, Pluckley pupils competed in the National Young Mathematicians Award 2011 Competition. Visiting Highworth School for Girls Grammar in Ashford they took part in a team problem solving task. Up against primary schools from across Ashford and the surrounding area, they acquitted themselves really well, finishing 4th on the day. Well done to our super Mathletes! With a further maths competition coming up next week - The Mathletics 4 Nations Challenge - everyone can take part - there will be no time for our able mathmaticians to rest!